DIY solar water heating systems are available from Northern Lights Solar Solutions. 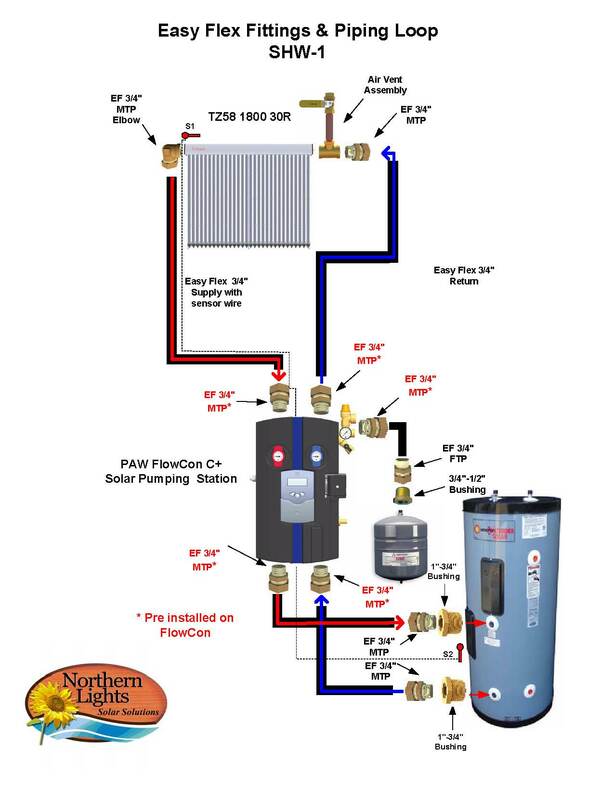 These systems are designed to be installed by a customer with no previous experience with solar water heating. The systems have been pre-enegineered to be optimized for the maximum performance, at the same time providing a system that is safe to operate. The DIY solar water heating packages include every component a customer will need to self install a solar water heater. The advantage of a DIY solar water heating system is that it can be installed by almost anyone with very little experience and no specialty tools are required. This means that the typical expenses of installing a solar water heater can be saved. This adds to the payback of your investment of a solar water heater. If you are not able to self-install a Northern Lights Heating system, you can always hire your neighbour or invite your father-in-law to help with this project, no licensed solar contractor is needed. Items such as stainless steel solar piping make it very easy for an amateur to pipe. This corrugated stainless steel also comes with 3/4" EPDM insulation and a protective coating. Also included is a heat sensor wire. By using this type of piping you don't need to worry about soldering and leaks. The fittings simply connect using a wrench, a high temperature gasket between fittings ensures a leak free seal. Our DIY Solar Water Heating Kits are built around our SunRain High temperature solar vacuum tube collectors. The systems are controlled by the RESol Pump Station with the BS digital differential controller. The other important part of the DIY system is the SolarStor Water heater with its built in heat exchanger and 4.5 Kw optional heating element. The system is installed by connecting the solar collector to the pump station and the pump station to the solar water tank. Simply plug in the pump station to a wall plug and within minutes you are producing free hot water. When installing a solar heating system, it is important that proper safety precautions are considered. Most times the collectors will be mounted on the roof. As such you need to be comfortable with ladders and roof top work. If you are not comfortable with this you can always hire someone to mount the solar collectors on the roof, or alternatively you can ground mount the collectors or place them on a wall. This is the most challenging part of completing a DIY solar water heating system.